Phil Vickery was a tight head prop forward who played 145 games for Gloucester between 1995 and 2006. He captained the club from 2001 to 2003. He won 73 England caps (47 of them as a Gloucester player – a club record). He went on two British Lions tours (to Australia in 2001 and to South Africa in 2009), playing in 5 of the internationals and played in three World Cups (1999 – 2003 – 2007), including two finals, playing on the winning side in 2003 and captaining his country in the 2007 final. Philip John Vickery was born of farming stock at Barnstaple on 14th March 1976. His family lived at Kilkhampton near Bude in Cornwall and he was educated at BudehavenSecondary School. He first met fellow Cornishman Trevor Woodman, his front row partner for Gloucester and England, at the age of 11, Vickery playing for Bude and Woodman for Liskeard. 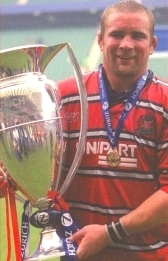 He went on to gain England caps at Colts and Under 16 level, and played club rugby for Bude and Redruth before joining Gloucester in 1995 at the age of 19. Earning the nickname “Raging Bull” which was to stick with him throughout his career and later become his company trade mark, his sheer size and power marked him out from the rest. After playing at England Under 21 level he quickly graduated to the senior England squad. Within three years of joining Gloucester the 21 year old Vickery came off the bench to play in England’s 60 points to 26 drubbing of Wales on 21st February 1998. His debut was followed by a summer tour which took in internationals against Australia, New Zealand and South Africa. It was perhaps the most demanding tour ever undertaken by England and ended a number of potential England careers, but despite sustaining a neck injury the following season Vickery came back to play in the 1999 World Cup. Another injury, this time to his shoulder, provided a further setback, but again he came back to tour Australia in 2001 with the British Lions, playing in all three tests in a series that was narrowly lost, although the forward battle was won convincingly. 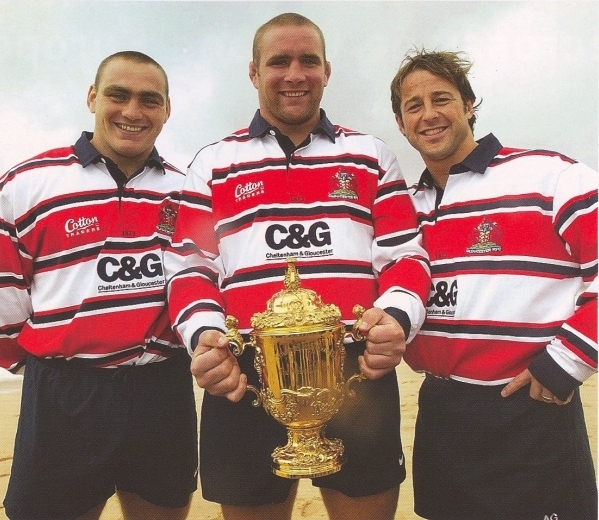 Vickery was Gloucester club captain in 2001-02 when they won the Zurich Championship, beating Bristol in the final and again in 2002-03 when they topped the Premiership and beat Northampton in the Powergen Cup Final, although he was injured and unable to take part in the match. Returning again from injury in the 2003 end-of-season tour of Australia and New Zealand which preceded the World Cup, Vickery came on as a replacement in the Wellington test and was part of a six man pack that repelled repeated attempts by New Zealand to score a pushover try, holding out for a 15-13 victory. He played in all seven games of the 2003 World Cup, captaining England for the first time against Uruguay. Vickery had formed a club partnership in the front row for Gloucester with loose head prop Trevor Woodman and that partnership dominated all opposition they met in the competition, although notoriously falling foul of South African referee Andre Watson in the epic final at Sydney, where England beat the host country 20-17. Phil returned home to be awarded an MBE and was also granted the Freedom of the City of Gloucester in 2004. Injuries to neck, shoulder, back and arm continued to hinder his career and to limit his appearances for club and country and in 2006 he was released by Gloucester and joined Wasps. Once again he came back from injury and resurrected his career, playing a further 26 times for England. He captained his country in Argentina and to the final of the 2007 World Cup and toured South Africa with the British Lions in 2009, playing in two of the three tests. Although struggling against Tendai “the Beast” Mtawarira in the first test where he was substituted, he came back triumphantly in the third against the same opponent with a dominant scrummaging display. He won the Premiership and the Heineken Cup with Wasps. Ironically, his last game for Wasps was at Kingsholm on 25 September 2010, when coming back yet again from injury, he suffered a further injury to his neck and on 28 October announced his decision to retire.